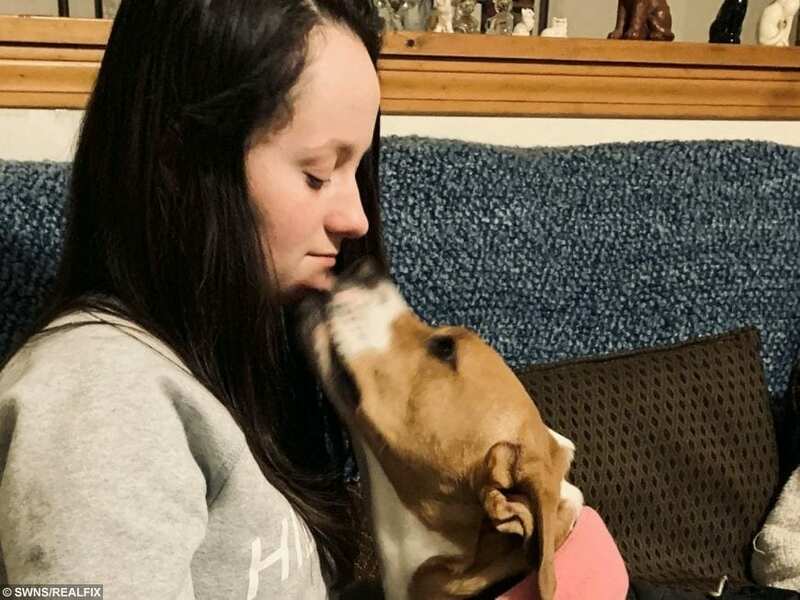 A teenager who could die from just a strong smell is being saved – by a specially-trained dog. 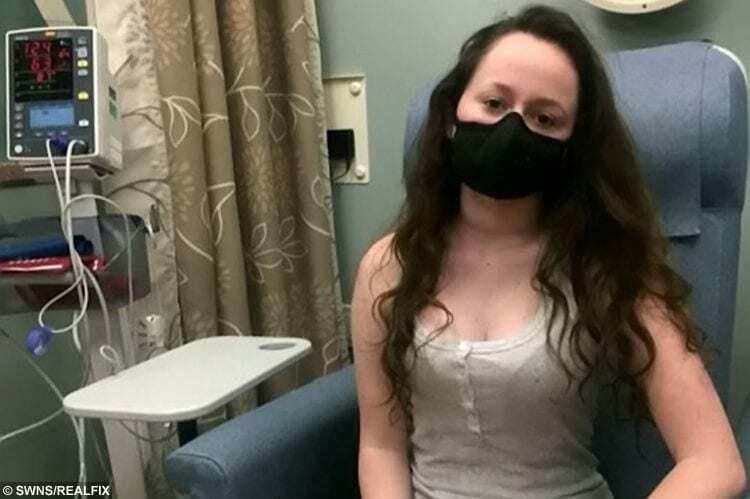 Martina Baker, 15, sufferers from an extremely rare condition called Mast Cell Activation Syndrome (MCAS). 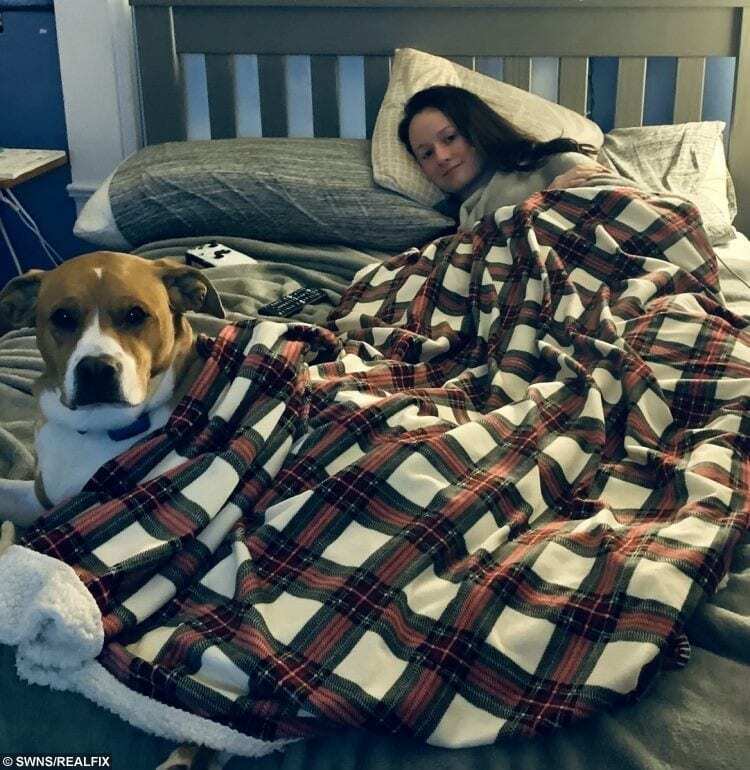 It makes her allergic to “almost everything” including heat, water, cleaning products perfumes and cologne. Even a whiff of cooking oils or bleach could send Martina into anaphylactic shock, and if she doesn’t receive treatment quickly she could die. 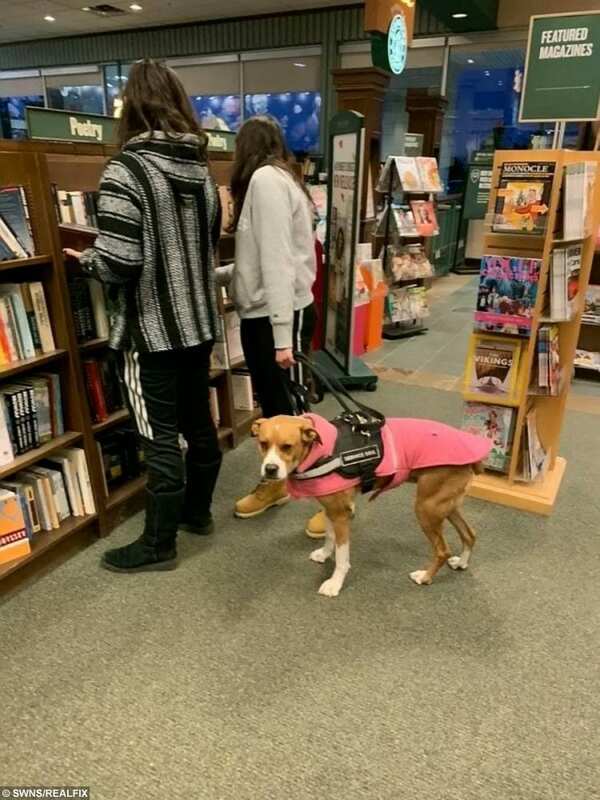 Martina Baker,15, wearing a protective mask.Martina Baker, who suffers from a condition in which a strong smell could kill her, is being saved by a specially trained service dog. The teen is also highly allergic to marijuana smoke, which poses a problem in her home state of Maine, USA, where it’s legal. Now, after raising $10,000 USD, Martina has a highly-trained pup called Caiomhe (pronounced Queeva) who alerts her to possible dangers before they happen. Thanks to Caiomhe Martina was recently able to sit through a movie at the theatre for the first time in years, and regain many aspects of a normal life. “Caiomhe has changed my life, I feel so much safer with her around, I am able to have a social life again,” said Martina, who was forced to miss school and stay at home in a sealed room to avoid anaphylactic shocks. “I lost a lot of friends after I developed MCAS, it’s hard for people to handle, for them to watch me collapse and have to take my EpiPen and be rushed to hospital all the time,” added Martina, who lives in Wiscasset. “It could be very lonely at times, but Caiomhe is always beside me protecting me, she’s a best friend for sure. Until two and a half years ago Martina was a completely healthy kid, but she suddenly became plagued with terrifying symptoms. “I wasn’t allergic to anything before, then one day I woke up with hives all over my body. The school student’s problems only intensified from there. 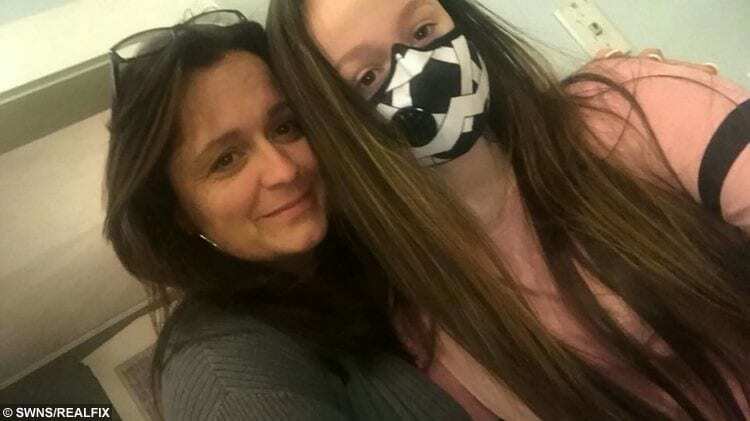 “The hives would flare up all the time, she’d go into anaphylactic shock and we’d to have to rush her to the ER about three times a week,” said Martina’s mother Loretta Morse Leighton, 48, a family therapist. Last summer a skunk sprayed off outside Martina’s bedroom window, she went into anaphylactic shock and had to be rushed to A&E. “Afterwards she had to go and live with a friend for almost two weeks while we had her bedroom windows and door completely sealed up, it was awful,” recalled Loretta. For months doctors had been baffled by Martina’s condition. 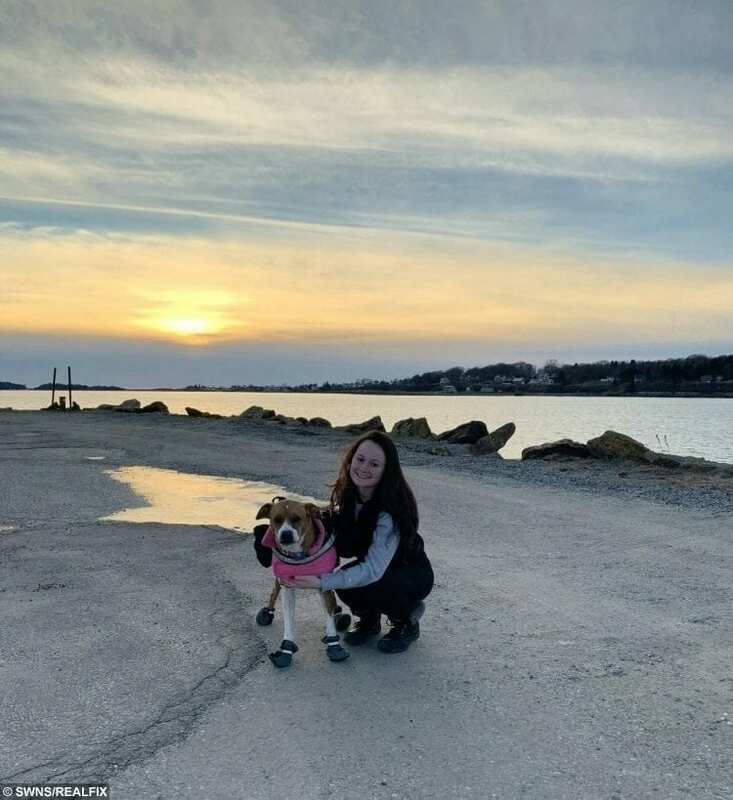 “We took her to see a specialist in every major discipline, everything from cardiologists to psychologists,” said Loretta, who eventually took Martina to an immunologist in Massachusetts named Jonathan Bayuk, who correctly diagnosed her with MCAS. Thanks to Caiomhe and regular mast cell stabilizing drugs Martina’s anaphylactic episodes have reduced from three times a week to once every four to six weeks. Loretta Morse Leighton,48, with daughter Martina Baker,15. Martina often wears a mask when she goes outside and the family still has to be very careful in their home. Loretta cleans with vinegar instead of cleaning products and has stopped using all detergents on sheets and clothing. They must practice “odorless cooking” and spend a lot of time grilling outside, even in winter. Martina is extremely sensitive to warmth, so her bedroom isn’t heated at all, even during the freezing Maine winters. Last year Loretta discovered that a service dog might help her daughter. Jamie trained Caiomhe to identify a long list of smells that are life-life-threatening triggers for Martina. 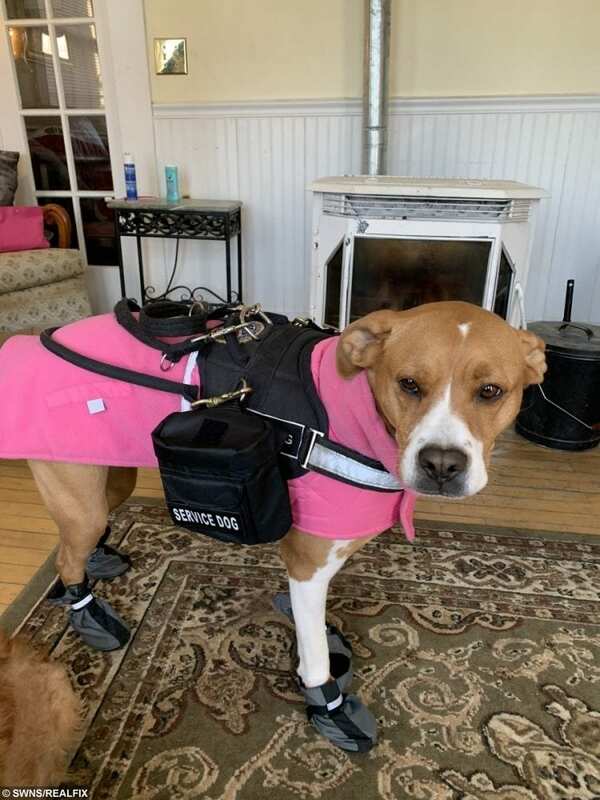 “A dog’s nose is about 100,000 times better than a human nose and just about every biochemical process in our bodies is indicated with a change in scent,” said Jamie, 66, who runs her own service dog business called Access to Service Corp.
Jamie had Martina send her pieces of clothing she had worn so Caiomhe could get used to her scent, including when she was in anaphylaxis because, to a dog, that scent is different. Caiomhe can now sniff out when Martina is having a reaction before Martina realizes it, because she can smell the release of histamine from her body. Martina and three-year-old Caiomhe were first united on Jan 5 and have been inseparable ever since. “Martina has endured a lot of staring, pointing and rude remarks etc, people do not understand, it’s very difficult for her but she’s stayed extremely strong, I’m so proud of her,” said Loretta. “I feel that Caiomhe was destined to be my daughter’s guardian angel.